Some foods that will be fortified with folic acid in 1998. 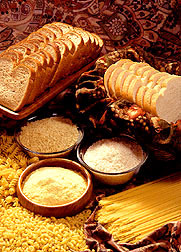 Beginning in January 1998, the B vitamin folic acid will be added to enriched bread, flour, cornmeal, rice, pasta, and other grain products, according to a 1996 U.S. Food and Drug Administration (FDA) regulation. The regulation grew out of evidence that the risk of spina bifida and other neural tube defects in newborn infants dropped if mothers took more folic acid before pregnancy. In 1992, the Public Health Service recommended that all women of childbearing age consume 400 micrograms (mcg) of folic acid daily to reduce risk. That 400 millionths of a gram could spare many of the 2,500 infants born in the United States with neural tube defects each year. But the defects occur so early in pregnancy—within the first month—that the damage might be done before an expectant mother began taking supplements. So fortifying the food supply was the most efficient way to reach most women of childbearing age. According to FDA estimates, the benefits of reducing neural tube defects outweigh the costs of fortification by at least 24 to 1. The potential savings from reducing cardiovascular disease and stroke may be far greater, says Katherine L. Tucker of the Jean Mayer USDA Human Nutrition Research Center on Aging at Tufts University in Boston, Massachusetts. Tucker collaborated with Jacob Selhub, Paul Jacques, and Brenda Mahnken at the USDA center and Peter W. F. Wilson, who is with the Framingham Heart Study, to produce the latest evidence that an adequate folate intake could reduce the risk of these diseases. Folate—which includes folic acid and its several food forms—is one of three B vitamins the body needs to convert the amino acid homocysteine to an innocuous relative. It appears that an excess of homocysteine circulating in the blood adds to the damage that restricts blood flow to the heart muscle and the brain, thereby increasing risk of a heart attack or stroke. In fact, says Tucker, other researchers estimate that high homocysteine increases the odds for coronary artery disease by 60 percent in men and by 80 percent in women, based on studies prior to 1995. And the odds for cerebrovascular disease increases by 50 percent in both genders by these estimates. A epidemiologist, Tucker and colleagues estimate that the risk of coronary artery disease may drop by 3 to 5 percent when grain products are fortified at the regulated level. The researchers analyzed data on the eating habits of 855 elderly men and women, along with their blood folate and homocysteine levels. The subjects, ranging in age from 67 to 96, were all participants in the Framingham Heart Study that began in the 1950s. As part of the study, they periodically fill out extensive questionnaires on their dietary habits and use of supplements and provide blood samples. Selhub had earlier analyzed the samples for homocysteine, folate, and two other B vitamins involved in converting the amino acid to a less toxic relative. In addition to projecting the effects of fortification, the researchers examined the major folate sources reported by the participants. "What surprised us was the remarkably strong inverse relationship between blood homocysteine levels and intake of cold breakfast cereals and of total fruits and vegetables," she says. "Each food group showed a very clear dose-response relationship." And that's after adjusting the data for age, gender, total calorie intake, and use of dietary supplements containing folate. Study participants who reported eating at least five to six servings of fruits and vegetables daily or one serving of breakfast cereal had the highest blood folate levels and the lowest homocysteine levels. Orange juice and dark-green leafy vegetables, such as broccoli and spinach, contributed the most folate among the fruits and vegetables, notes Tucker. Dried beans and peas and most berries are also good sources. The highest homocysteine levels were found in those who ate less than three servings of fruits and vegetables daily and seldom ate cereal. Supplement users had the lowest homocysteine levels, but not much lower than frequent consumers of fruits, vegetables, and cereals. "This suggests that people can substantially reduce their health risk simply by changing their diet," she says. "That's especially important for the elderly, who tend to have low folate status." She suspects the findings will be true for younger people and plans to look at eating patterns of the offspring of Framingham study participants. Using the dietary data, Tucker and colleagues estimated how the currently mandated level and three higher levels proposed during the decision-making process would affect the elderly's total folate intake and blood homocysteine. At the mandated level, a little more than half the elderly population would get the desired 400 mcg of folate daily, compared to a third without fortification. And the percentage of elderly with high homocysteine would drop from 26 to 21. That percentage would continue to drop at increasingly higher levels of fortification (see graph). So why not add more folic acid to selected foods? In addition to the added cost, “there’s the concern that fortification will add to the already high intake among supplement users and thus cover up a deficiency of vitamin B12,” says Tucker. Deficiencies of either folate or B12 cause a type of anemia (macrocytic) that can be corrected by taking folic acid. So adding extra folate to the diet could mask a B12 deficiency, because the standard diagnosis for B12 deficiency tests for anemia. “It’s like covering up a red flag,” Tucker explains. Moreover, some suggest that extra folate can actually trigger nerve dysfunction due to B12 deficiency, causing symptoms such as diminished sense of balance or sound perception. “It’s a problem that needs a lot more attention, with or without fortification,” she notes. One in five people over age 60 and two in five people over 80 don’t secrete enough stomach acid to absorb vitamin B12 in their food, according to other research at the center. So they can be deficient even if dietary intake is adequate. And many cases of deficiency go undetected because many deficient people aren’t anemic. “We need a better diagnostic approach,” says Tucker. Until that happens, the question of folate fortification is a balancing act between adding enough to reduce disease risk without masking vitamin deficiency. To that end, Tucker estimated how much the different levels of folate fortification might increase the risk of imbalance. 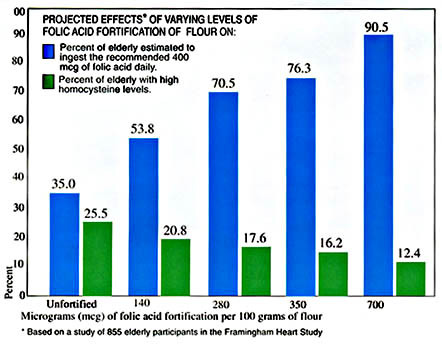 Using a daily folate intake of 1,000 mcg as the threshold, the risk stayed well below 1 percent of the elderly population at the mandated level and at 280 and 350 mcg per 100 grams of flour. Imbalances are most likely to occur in people who take supplements, because few would get enough folate through diet alone. The elderly can reduce this risk by making sure their supplement contains substantially more B12 than the current Recommended Dietary Allowance, says Tucker. People who can’t absorb the vitamin from foods because of low stomach acid can absorb some of the crystalline form in vitamin supplements. “The balance of evidence from this study suggests that the benefits of folate fortification at the currently mandated level would greatly outweigh the risks,” she concludes, adding that a better diagnosis for B12 deficiency should be given high priority. — By Judy McBride, ARS. Jean Mayer USDA-ARS Human Nutrition Research Center on Aging at Tufts University, 711 Washington St., Boston, MA 02111; phone (617) 556- 3351.